The Camping Afrodite, which is open all year round, is situated in a mature wood of birches by the beach of Caulonia Marina. Its ideai location at the seafront and within mature vegetation guarantees a shady setting and a fresh coastal breeze during the hot summer days, while the winter cold weather is mitigated by its exposure to the sun and its closeness to the sea. The nearest airports are Reggio Calabria and Lamezia Terme. 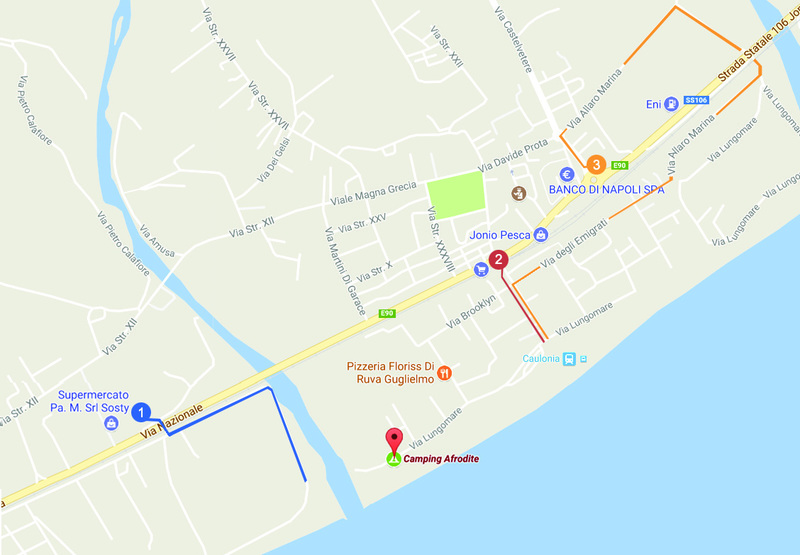 From both you can take a bus or a regional train to reach Caulonia Marina. The nearest station to our campsite is Caulonia. The station can be reached by regional train from the main stations throughout Italy. High-speed service is available up to Lamezia Terme Centrale (about 1:30 h from Caulonia). There are three railway underpasses to access the camping. Two can only be used by cars, small vans and small campers. The third underpass is obligatory for all vans, caravans, campers, and large vehicles. Follow the orange line on the map.